Hello Cricut friends! It’s Cori from Hey, Let’s Make Stuff back with another tutorial about using fonts in the Cricut Design Space. You can see my first post here—it covers the basics of using fonts! 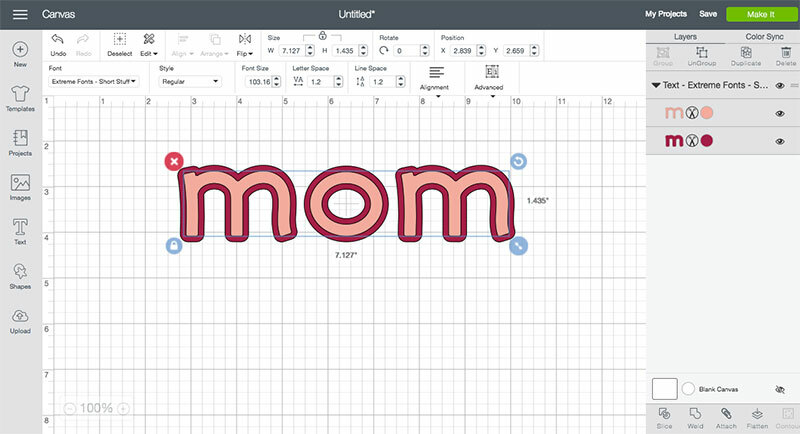 I recently went back to that post’s comments and saw that many people asked how to create a text shadow in Cricut Design Space, so I thought I’d share a few different ways to do this. 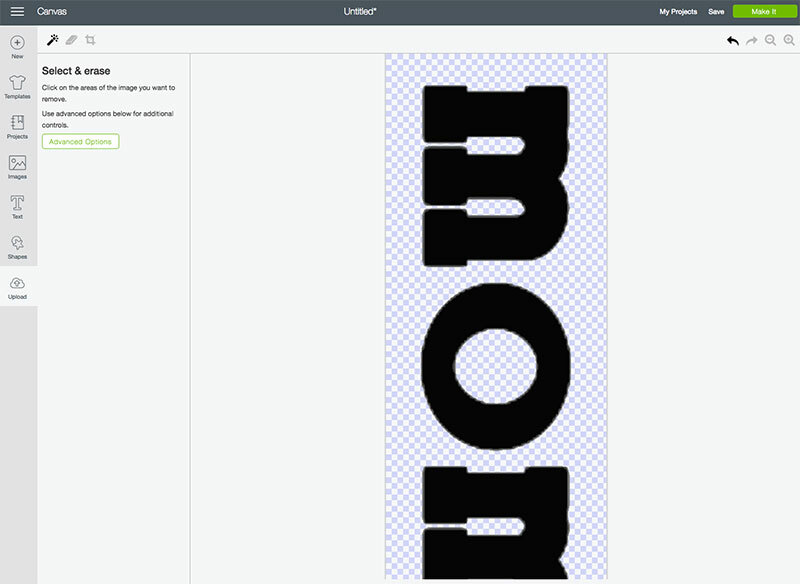 When you are selecting a font in the Cricut Design Space, there is an option to filter your fonts by “multi-layer” fonts. 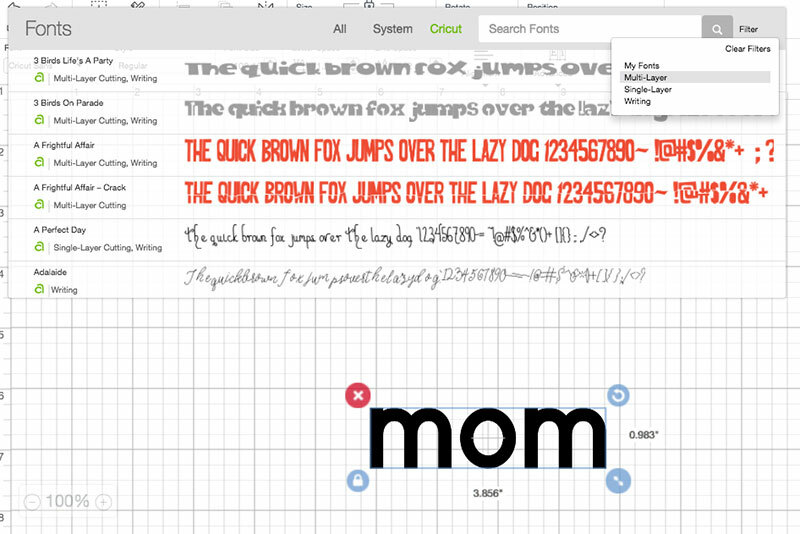 This is the easiest way to make a shadow for your fonts since the shadow is built in! Once you select a font, however, the shadow layer may be hidden, so you’ll have to click the eye next to the layer in the Layers panel to show it. Extreme Fonts – Short Stuff is a good example. Note that some multi-layer fonts may not have a shadow layer—their additional layers may be other coordinating elements, like County Life, which has banner shapes instead of a shadow. I believe most readers wanted a shadow that encompasses the entire text, but I also wanted to share how to create a simple offset shadow. This is very easy. 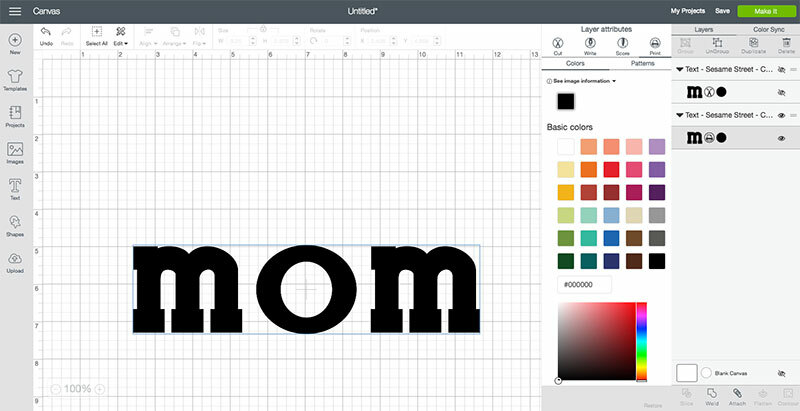 Using the text tool, write your selected text in whatever font you choose (this works for both Cricut fonts and System fonts). 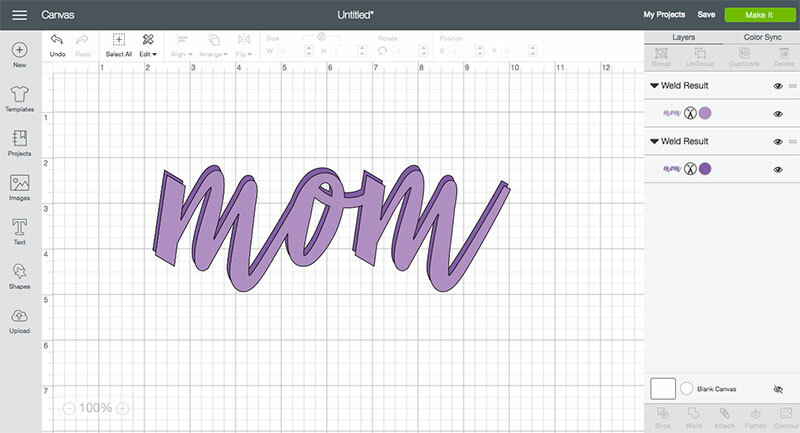 Weld your text if your letters are connected to create one shape. Select your text box and copy it, creating an exact duplicate. Then offset the top layer over the bottom layer. I prefer the top layer to be slightly to the right and slightly down from the bottom layer—this creates a fun offset shadow. I used the Cricut Wildflower font here, one that I continually come back to. Before you go to all the hard work of creating your own shadow, take a peek in Cricut Access to see if there’s an image in there that will work! For example, there’s a great floral-y Mom with a shadow that could be so cute on so many projects. This is image #M43488 from the Mother’s Day 2010 set. In the comments of my original post, a creative reader named Tina offered a workaround. 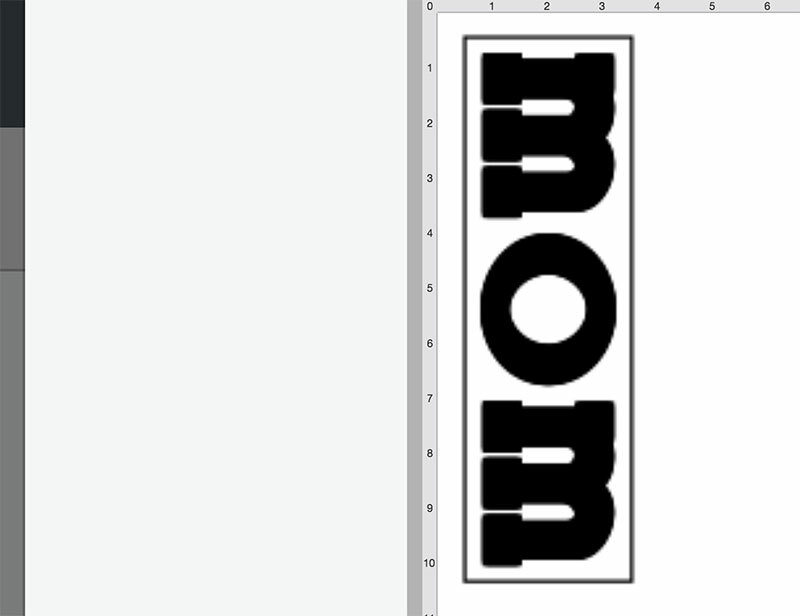 I gave it a shot and it worked to create an outline around any Cricut or System font you want to use. 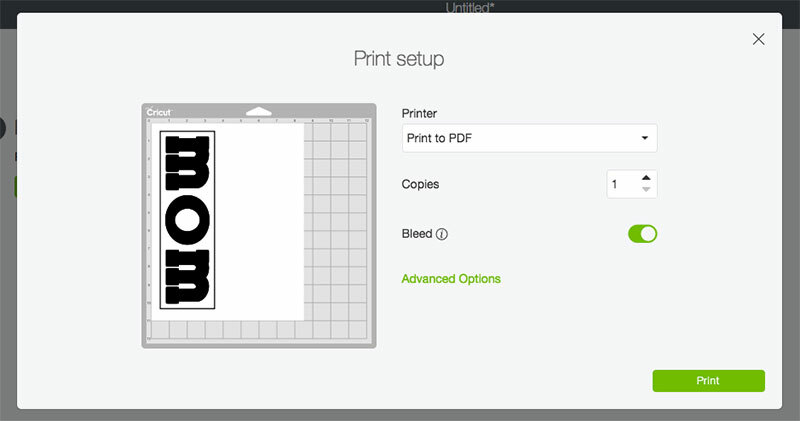 It only works on desktop, because you need the ability to upload your own files to Cricut Design Space. It’s not a perfect solution and your shadow may be a little ragged, but hey, at least it gives you options! Start by creating a text box, making sure there is a little extra letter spacing (using the letter spacing adjuster in the font toolbar) so that there’s room for your shadows. Make it black for the most contrast possible. I’m using the Sesame Street Celebrations font here (which does not have a shadow option), with letter spacing of 1.3. I also made it as large as Print Then Cut will allow: 9.25”. Make a duplicate of this image so you have two of them, and then hide one of them. 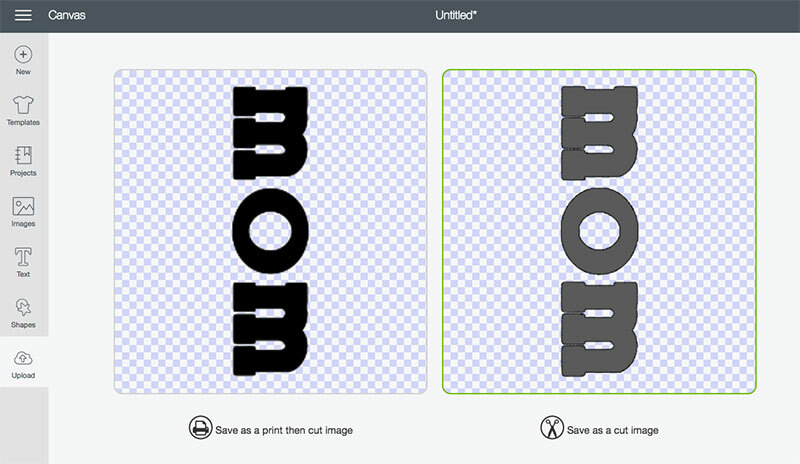 Change the remaining visible layer a Print image, which will flatten it. Then hit Make It. This will bring up the Print then Cut screen. Continue until you get the Send to Printer dialogue box. Once this pops up, make sure “Bleed” is selected. Your text will show up vertically because it’s the largest size it will fit on a piece of paper, which will make the cleanest shadow. Now you have two options. First is to right click and save the mat image to your desktop as a PNG (the file type should be automatic). Then cancel your project to bring your screen back to the main canvas. This is the easiest way to do it, but it often isn’t detailed enough when brought in as an image. You can give it a shot and if it gives you really rough edges, go with this next method. I like to zoom in my browser until my text is much larger. Then I use the Selected Screenshot Tool on a Mac (shift+cmd+4) or Snipping Tool on a PC to take a screenshot of just the text. Then cancel your project to bring your screen back to the main canvas. Then you’re going to use the Upload box on the left-hand menu to upload the PNG or screenshot you saved. Choose a Complex image and click continue. If needed, use the magic wand and the eraser to “erase” any negative space around your letters. You will also want to erase the black registration box around your text. Click continue. Then import it using Save as a Cut Image. Once it’s back into your Design Space canvas, delete your original text that you flattened into a printable image. Unhide the hidden text cut file. And then resize and recolor your new shadow piece behind your text piece and you’re good to go! As you can see, the shadow layer is pretty clean, but not as clean as the text layer. Even so, it’s still a fun way to create a shadow layer if you really want one. Play around with the different settings as you go—you may be able to get an even cleaner shadow! Hope you found these tips for creating a shadow helpful. If you have any additional methods, I’d love to hear them in the comments! Oh my gosh, I cannot thank you enough for this tutorial! I have been grieving the loss of the shadows in the Jasmine cartridge ever since I went ‘full digital’. The phrases, like “With Sympathy” and “Warmest Wishes” used to have wonderful shadows, and they are now gone. But thanks to you, I was able to use the Print then Cut hack to create almost perfect shadows for these phrases. I just cut it out and it is magnificent. Thank you so much!!!! Hi. What browser are you using? Sometimes it can be helpful to do things like clear your browser cache, restart the computer, etc. If you are still having problems, contact our support at cricut.com/chat. I hope it works better soon! how do you create an offset around the entire letter instead of a shadow? Creating outlines and shadows easily around text and images should be the next thing that the developers should be looking at, that and more design tools within design space. I have used sign making software and these effects were available 20 years ago. 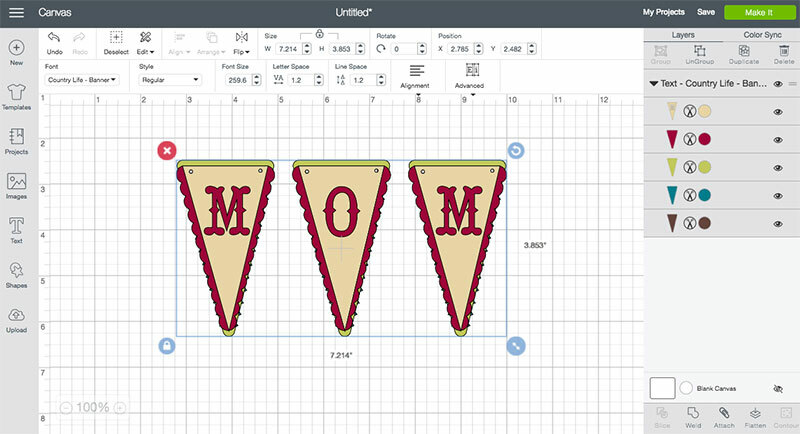 As a new cricut user but a old time designer I do find the options on the new maker very basic, and yes the system bogs down my computer Should be more up to speed with other design packages available out there.